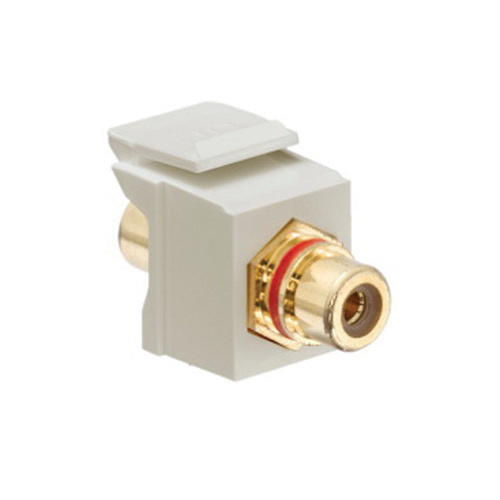 Leviton QuickPort® RCA QuickPort connector in ivory/red stripe finish, features high-impact fire-retardant plastic with gold-plated surface construction. It has a dimension of 1.22-Inch x 0.575-Inch x 0.636-Inch. The wall jack accommodates snap-in style RCA, female-to-female connector. This connector for advanced audio, offers audio connectivity for workstation cabling for termination on UTP cable, speaker wire or shielded AV cable. Connector is UL/cULus listed and CAN/CSA certified.